The teaser poster for Adam Sandler's first-ever sequel, Columbia Pictures' “Grown Ups 2,” is now online. Starring Adam Sandler, Kevin James, Chris Rock, David Spade, Salma Hayek, Maya Rudolph, Maria Bello and Nick Swardson, “Grown Ups 2” finds Lenny (Sandler) having relocated his family back to the small town where he and his friends grew up. This time around, the grown ups are the ones learning lessons from their kids on a day notoriously full of surprises: the last day of school. 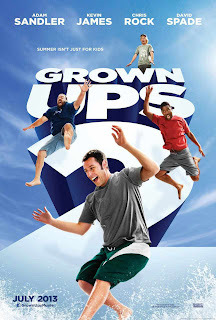 Opening across the Philippines in July 2013, “Grown Ups 2” is distributed by Columbia Pictures, local office of Sony Pictures Releasing International.